Get lost – Find Beautiful with East Coast Glamping. Nova Scotia. Bell tent experiences/sales/parties. Welcome to East Coast Glamping! We are proud to bring glamping to the Maritimes. This summer experience boutique Glamping in Nova Scotia and throughout the Maritimes with our various packages. East Coast Glamping for 4. AnnaBell Unit# One for 4. Deluxe Slumber Pack for 4. ECG Cosy Fleece Blanket for 2-4. We’re not about roughing it. Details matter. Ambient LED lighting with each pitch, along with rugs and a ‘We love local’ welcome kit. 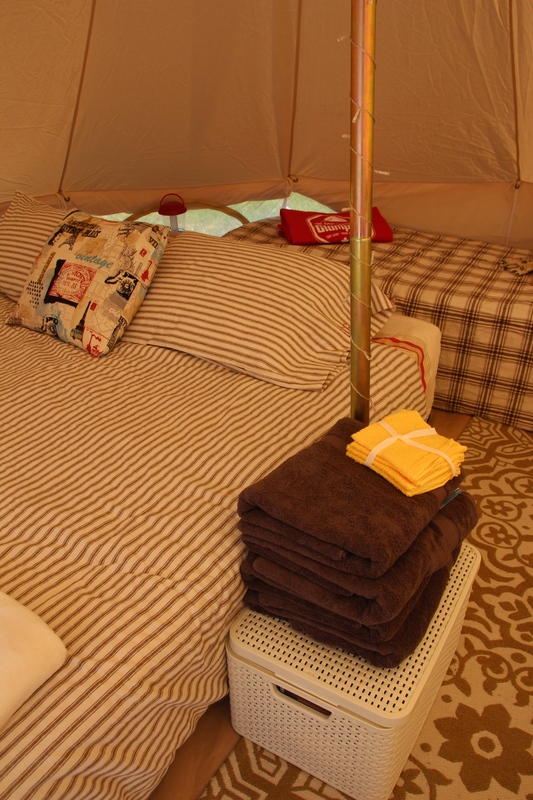 Enter an East Coast Glamping bell tent for 2 people. Our standard Slumber Kit comes with camp beds and cover sheets only. Enjoy french press local coffee in your Bodum. Roll up the bell tent sides and relax with a warm breeze. East Coast Glamping Pantry Packs have everything needed to cook at your campsite, including picnic table and seat covers. ECG cooler and egg carton with Pantry Pack. Connect with us for a Quote and availability. Or visit our Website to book.